Should I be using the A setting ( all I get is ---F ) or the aperture ring? I have the setting in the menu set cause I can use both lens without a hassle. From what I know, Pentax has never made any extension tube with pK-A mount. For now, I assume your extension tubes have pK mount. An extension tube + lens combo does NOT focus to infinity. The point of using an extension tube is to focus at short (macro) distance. The lens's focus ring can be used, but it has very limited range. It's easier to focus by moving the whole camera setup back and forth. A pK-mount extension tube can be used only with lenses with aperture ring. 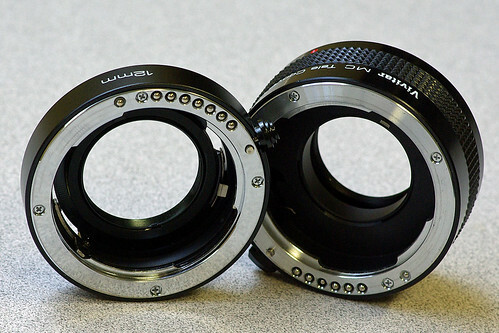 In this case, the combo lens acts as a pK-mount lens. You have to use it in stop-down metering mode: set camera mode to M, use the lens's aperture ring to control the aperture, and use the green button or the AE-lock button (depending on the camera) to meter (note: if the camera is of K series, exposure will be off big time). 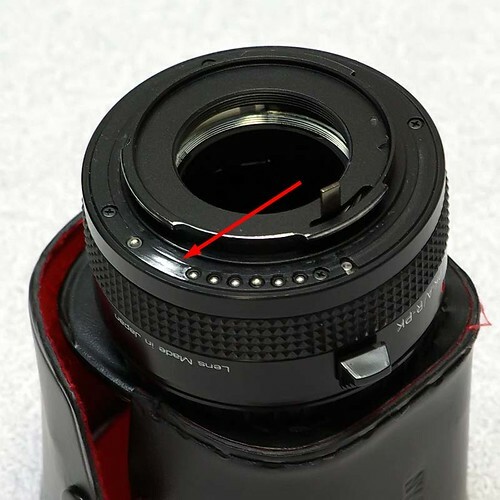 If you use a pK-mount extension tube with a lens without an aperture ring (or with a pK-A lens with the aperture ring set at A), there is no way to control the aperture. It's always at the smallest aperture. Are they Pentax or another brand? Do they have any pins? I have a set of King A rings with pins but needed to create another contact (from 6 to 7) to get A to work. I have a set of King A rings with pins but needed to create another contact (from 6 to 7) to get A to work. In fact, 6 contacts (7th is grounded) is better than 7 contacts. SDM lenses don't work with extension tubes that have 7 contacts. You'll have to ground the 7th contact for SDM lenses to work. They say Asahi pentax japan, no's 1,2 and 3. There is a single pin that I can push down. I can achieve focus by moving the camera. K mount.....with a K5. Yes I did! Exactly what I did! I went from 6 to 7 contacts by creating the 7th by scratching away the paint exactly as you have posted. I didn't join 6 and 7 if that was your interpretation. I created an additional, or 7th, contact. your smallest extension tube is normally aroung 12mm, which puts your focusing range between about 25cm (at infinity) and 200cm at minimum focus. you will find a macro focusing rail is a must when using extension tubes.